After two weeks in hot and steamy Laos we were on our way back to Vietnam after two months away. This was the first time since January that we entered a country without needing to buy a new Visa so that was nice. We left Vientiane with the sky that weird hazy white that comes from it being too bloody hot for the colour blue to survive and landed in the greyness of Hanoi where we were introduced to rain for the first time in 60 days. 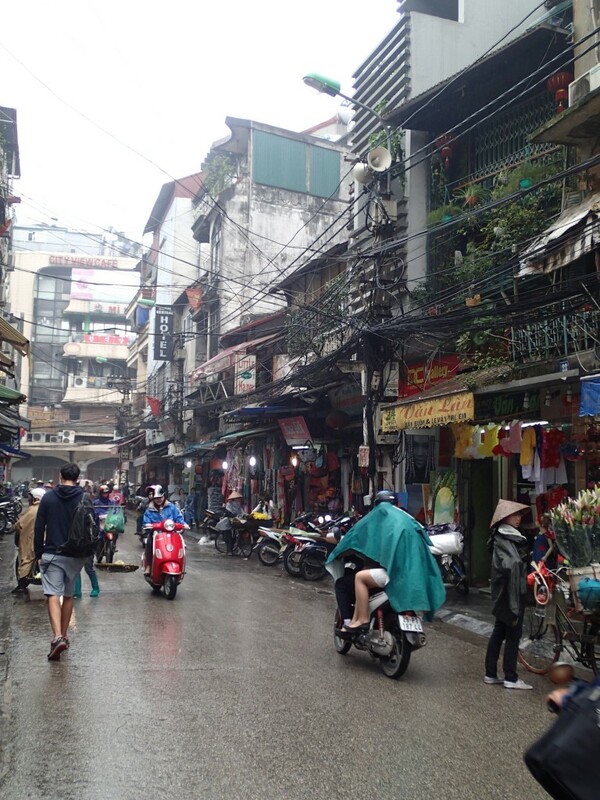 The old town in Hanoi, where we were deposited by our taxi, is a bustling, busy maze of narrow streets, beeping bikes, spitting street sellers and 1001 tiny shops selling everything and anything. Due to the way that land and property is sold in Vietnam under the communist government almost every building is very narrow. As such all shops are long and thin, all hotels are long and thin and most restaurants are yup, long and thin. After checking in at the absurdly friendly hotel and getting changed from 40 degrees weather into something more appropriate for mizzling, drizzling, spitting greyness we set out to walk the streets of the old town in search of Beer corner. A wrong turn out of the hotel and we found ourselves facing Hoam Kiem lake which turned out to be a great mistake as it looked beautiful in the mist with lights twinkling over its inky blackness. We swiftly turned around though as fresh brewed beer was lurking around the corner, somewhere. We found it. 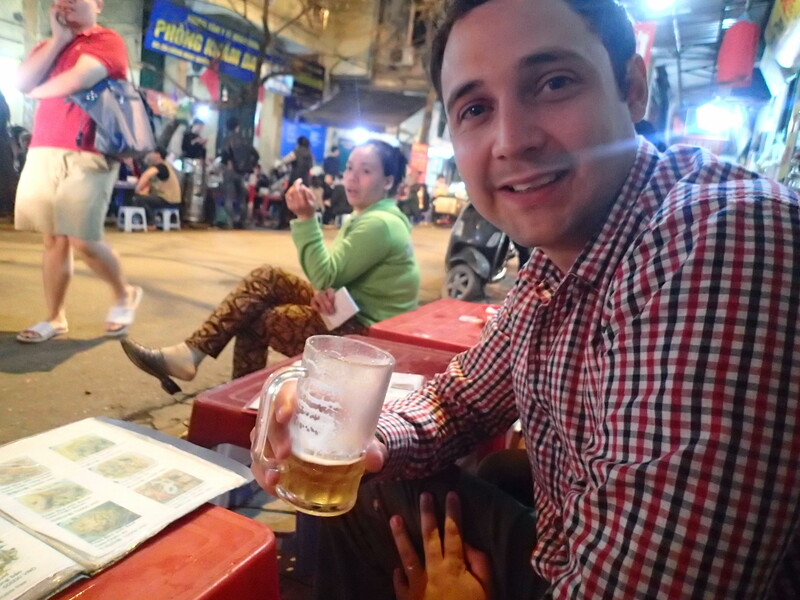 Admittedly, having nearly been run over by cars and bikes quite a few times as we reacquainted ourselves with the pace of Vietnam city life. Still just in one piece we sat down on the tiny plastic stools and before we knew it were clinking glasses, Zo-ing (cheers) and tasting the wonderful fresh taste of bia hoi. This time last year I was in Munich drinking fresh beer in the snow as Arsenal beat Bayern 2-0. On remembering this we were swiftly debating why England, the land of beer and beer drinkers has no fresh beer. Ze Germans have it, the Vietnamese have it so why no fresh beer in the UK? No doubt Shoreditch has a popup somewhere but that doesn’t really count. The evening passed in a splendour of local beer, local food, including of course Pho and a delicious clay pot chicken curry type dish that oozed awesomeness. With a few days to spend in Hanoi before we ventured to Ha Long bay we may have allowed ourselves an extra beer or two. The next day was spent walking around the city taking in the delights of the Old Town and booking our Ha Long Bay trip with Vega Travel. As we seem to do everywhere in Vietnam we opened ourselves up to the delights of propaganda by visiting Ho Lao Prison where Senator Jon McCain was kept prisoner during the war after he crashed his plane into the lake, idiot. 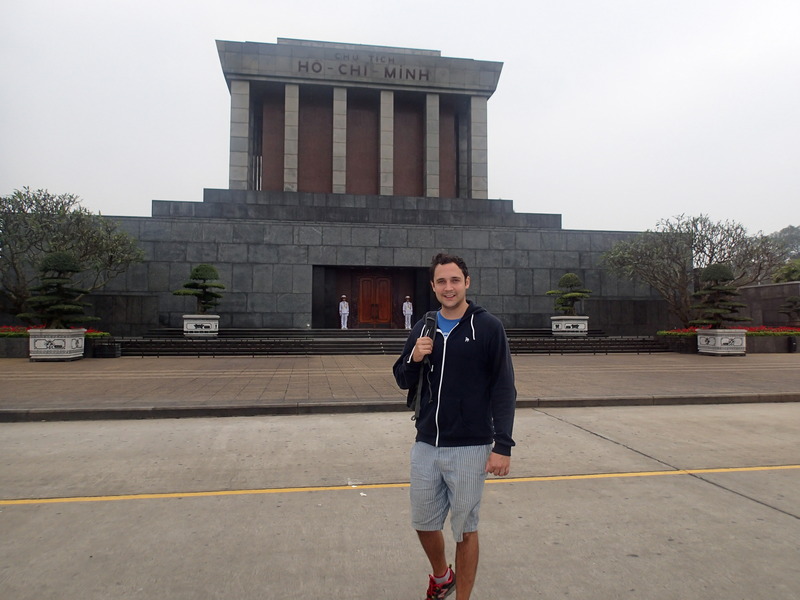 It was also where the French imprisoned political prisoners during Vietnam’s slow fight for independence. On a wet and dreary day, the prison was a pretty foreboding place with the cells on death row particularly eerie. It is a shame though, that only 20% of the prison remains as the rest has been replaced by a huge sky rise and convention centre. After the prison we grabbed lunch and then wandered the narrow streets of the Old Town. We visited St Joseph’s Church which was pretty impressive and other than that just generally became in equal parts lost and enchanted by the streets. As the mist of the day increasingly slicked the streets and the spray of the bikes soaked our shins we stopped for a bia hoi or two and decided to retire and rest up for the evening. Although, not before sampling some lovely skewers from a little old lady on the side of the road. Dinner was uninspiring but cheap in a place that had looked buzzing in the day but was pretty quiet at night. Carry on. Our last day in Hanoi before we headed to the Bay was again spent walking around as we try and stretch our legs ahead of Nepal. 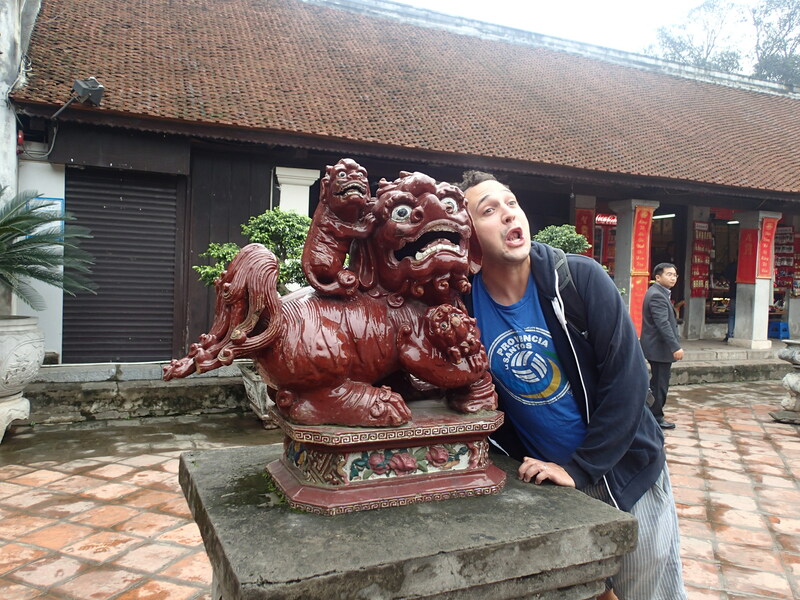 We headed out to the Temple of Literature built to celebrate Confucius and his merry/wise men. We then headed off in search of BBQ chicken street. We found the street but unfortunately it seemed they only served at night as there was no delightful smell of sweet marinated bbq chicken served with bbq sweet potatoes and honeyed bread. 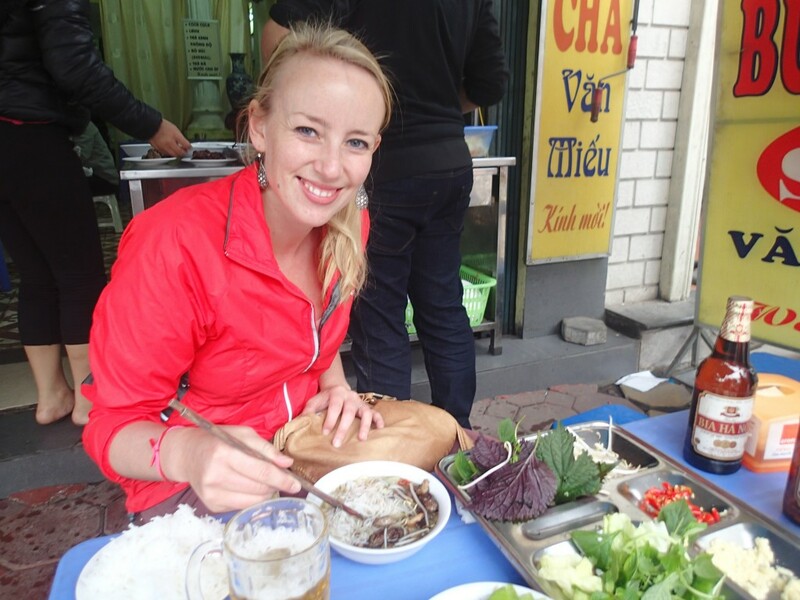 Instead we ate some bun cha by the side of the road. Sweet porky goodness in a soup to which you add, noodles, chillis, garlic and vegetables in whatever quantity you like. The locals polish off bowls in about 90 seconds – we took a little longer. In the afternoon we headed over to the Old Citadel where we saw Ho Chi Minh’s mausoleum – closed on Fridays so we didn’t make it inside. We saw a massive statue of Lenin, some ridiculously large private residences, Ho Chi Minh’s old house, the presidential palace and other grand buildings that seem a world away from the narrow confines of the Old Town. Next we wandered around the lake meeting some massive great dogs that luckily seemed pretty relaxed as we strolled past. Then it was slowly back towards the Old Town and the massive local market. Before we braved the market we stopped off for another local speciality: egg coffee. Apparently bubble tea is now a thing in the UK and as far as I can tell we imported the wrong weird drink. Egg coffee is awesome, like a mix between coffee and custard with crème brulee smoothness. Strong coffee and thick frothy egg don’t sound like a marriage made in heaven but they surely are. You can keep your tapioca tea I’m learning how to make this. The market was big. It was for locals. We felt like voyeuristic tourists walking around and were treated as such with not a single person trying to sell us anything! Before we knew what had happened it was late afternoon so we headed back to the hotel to rest our weary feet for an hour before venturing out for more bia hoi. We met a lovely Australian/English couple who were volunteering in Vietnam and had spent several years in China working for a shopping mall. The evening went on and on as we chatted and had far too many beers eventually drinking the small bar dry of their fresh beer. Finally we were all kicked out by the police as we were in danger of breaking the curfew that rules here at midnight. Needless to say we woke feeling pretty groggy at 7am for our four hour minibus trip to Ha Long Bay. That though is for another blog. 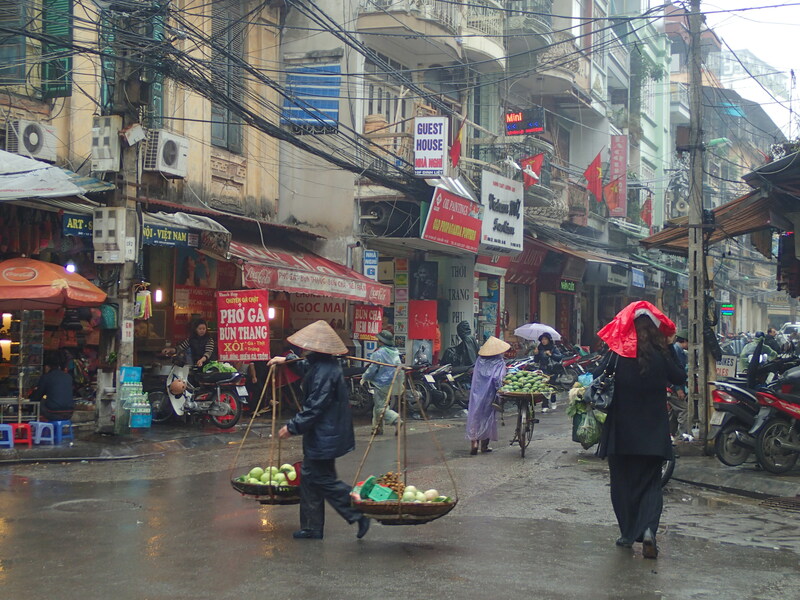 For now, it is goodbye to Hanoi until we return in a few days time to this wonderful chaos. An absolute belter of a city that somehow continues to function despite the growing population, more and more tourists and its incredibly narrow streets. We’ve had a blast.